They just want! They know what they want and how they want it. Only sometimes they may know why they want it. Nonetheless, they want and that’s explanation enough. And you, loving parents, need to give, or to put it in the blackmailer’s language, provide. But wanting and getting isn’t always so bad. As a parent nothing makes me happier than my child asking me for books to read, for instance. It is a “demand” I love to meet and never argue against because I always feel like I’m pandering to my childhood love too as I cater to my child’s. Plus, it’s a great first love to have. Books! So be it book fairs or book shops, jumble sales or Children’s Day coupons, this mother hunts for good books with a zeal which she doesn’t even show for good food. Ahem. So, what is a good Children’s book according to me? One which excites them, frees their imaginations, makes them feel, makes them question and maybe makes them learn a thing or two about their world, about gentle manners, values like team work and Quantum Physics, why not? They grow up so fast! And these days, academic pressure... Sorry. But you get the idea. That’s a good book there for me, minus the Physics, that is. What is an even better book? A uniquely personalized book. No, not one which simply copy-pastes your child’s name in place of Prince Charming but something like ‘Oh! 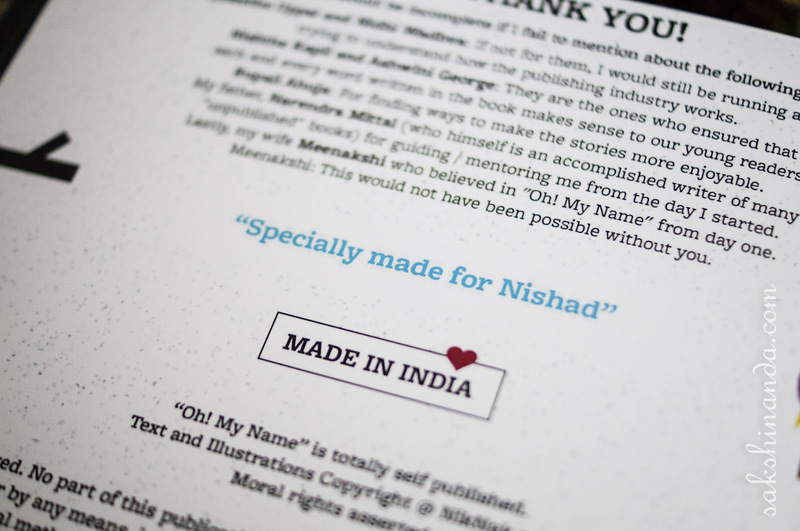 My Name’ by Nikhil Mittal, which takes personalization to a level beyond mere labeling. It’s a concept which instantly caught my attention and later my appreciation for how it involves tiny readers. When I ordered the book online, I was asked to write a Dedication which would actually be printed in my copy of the book. You could write anything under the sun and over the moon, addressed to your child and signed off with your role of ‘Papa and Mama’, or whatever your relationship is with the kid you are ordering the book for. I thought it was a great opportunity for me to give him my list of Life’s 10 Most Important Lessons but his father disagreed. So a sweet little wish for his dreams to come true it was to be. This idea of creating a dedication not just personalized the book but also added an emotion to the giving of the present itself. The printed words making owning this book even more special. But it doesn’t end there, the promotion of a lovely ‘this is my book!’ sentiment. ‘Oh! 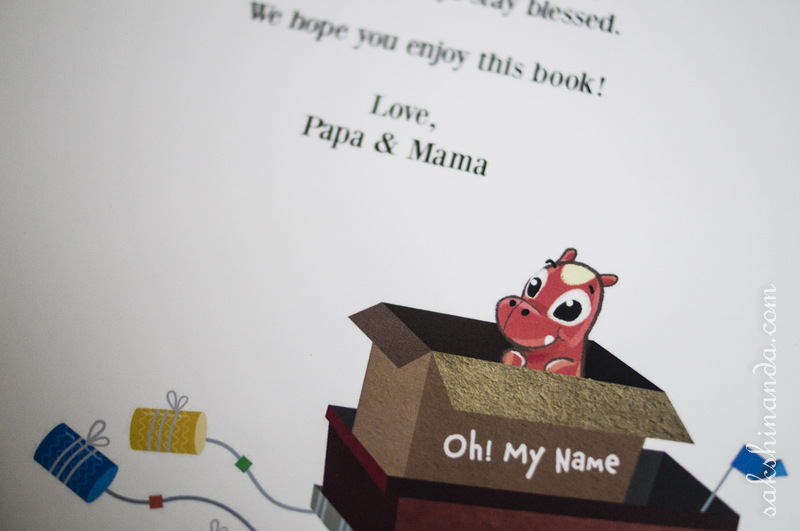 My Name’ makes your child a part of the book. Literally. This is the story of a boy/girl who has forgotten his/her name and is looking for it. The name is put together letter-after-letter and page-after-page in an adventurous tale. The wonderful twist is, your child is the protagonist of the story and it is he/she looking for the name. No surprise then that it is his name spelled bold and bright in white at the end of the tale! The boy in my book, with a unibrow and wearing a red cape, meets different creatures as he journeys ahead. His friend and ‘ally’ Dabi goes along; a favourite toy magically turned real. With expressions of bewilderment and wonder, he meets some animals that he knows and some fantastical creatures like Ila Pika who he is happy to now know. Everyone gives him a letter to take along, in return for what goes on. What goes on is a secret I’m keeping! 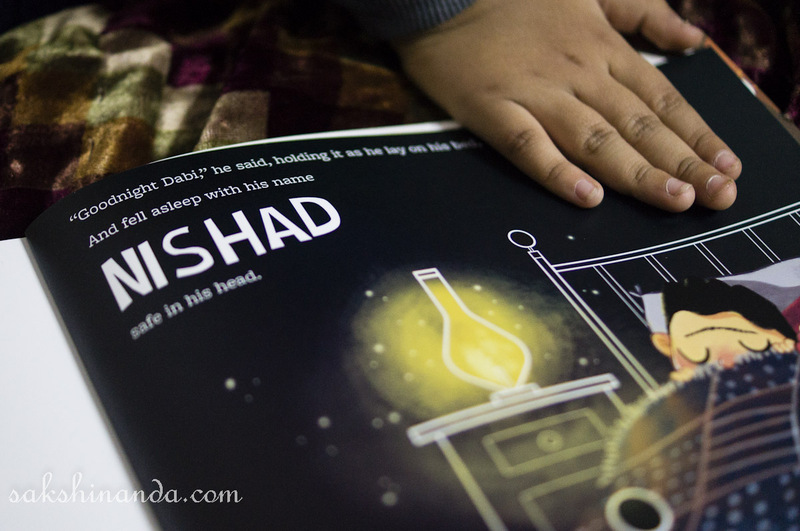 The story is brought alive with big and beautiful illustrations in a book which is printed on a wide landscape format and is super easy to hold. The story is brought home in a child’s mind with its rhyming sentences and simple expressions. 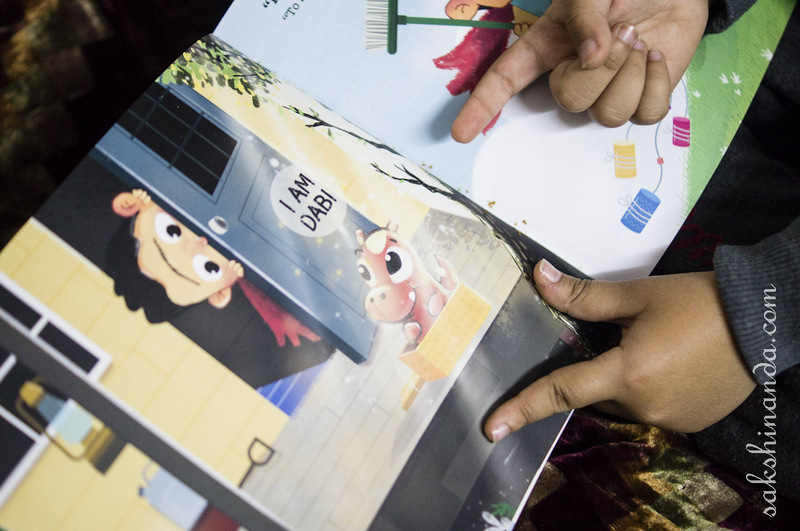 Invented sound words like ‘Ho Ho Hokeya’ make reading aloud fun and some conversations are bold and big to be read even louder, perhaps. There are lessons and messages gently tucked inside the story, without making it sound like school curriculum. Each tiny episode of meeting a different creature makes the boy in my book make the boy reading it learn something. Take help when you need it, but don’t forget to lend your helping hand when another needs it more. So if in the first part it’s the boy taking help, in the second he has learnt to help back. Both appreciation and gratitude abound, along with thank yous and awards. Dabi, the magical toy, stands for that magic which shows itself when you most need it. It tells children that friends help. Strangers become companions. The universe comes together to lead you on to happiness. Even a snake can give you something that ‘will help you make progress.’ The important bit is to move onwards. And even more, to know yourself. But for now, your name would be enough. ‘Oh! My Name’ is great for pre-schoolers who are just jumping into the sea of phonetics as well as early-readers. This book will certainly make them identify the letters of their name, in the correct sequence at that. Of course, adults will have to help them read the rest of the book. It can make for a good first introduction to many animals too! Words like ‘Organic’ and a picture of Shakespeare made my reading session with my five-year-old digress into unchartered territory. Even more fun! The mystery keeps them hooked, even if the older clever clogs realize the spelling of the name rings a bell. So if by the time NIS have been found and Nishad guesses it’s his name, how the rest of the letters will appear in the story keeps him reading on. For those who don’t make an effort to start putting the letters together as they read, well, the book holds a bigger surprise then! Who says being lazy is bad, huh? There was one thing though, in NISHAD’s story that caught my eye. The transition from I to S, only, seemed like a jump. If the book is created by stringing letter-episodes together, it should be seamless. ‘The boy was looking at a creature’ could begin ‘Just a few steps ahead…’ for example. That would help maintain a continuity to the journey. However, such nuances are for the adults to notice in their boring grown-up critical worlds. Children don’t have time to waste on such nitty-gritties. All mine had to say when I asked him about it was ‘I don’t know what you mean. I only wish my name were very loooooong’. Request denied, of course. While ordering the book online I could read the complete thing with just a ‘tap to open’. Just a sample page as preview would have been enough, or it takes away the charm for adult readers who love tales written for children. (Pssk! It did make me create one in my name to read.) I also found out that the same letters in two different names have same episodes in both books. But repeat letters in the same name have different episodes. Which means multiple stories have been created for the many letter combinations. Which also means siblings with common letters in the name will share a little more than just their parents. What if siblings could become characters in the same book, looking for letters of their names appearing all jumbled up? Fighting to own the first shared ‘A’ or ‘I’? Oops. Sorry. I digress there. ‘Oh! My Name’ is a lovely book created with much thought. It came along with a muppet of Dabi, who has now occupied pride of place in my child’s bed. He felt immense surprise followed by interest and joy on receiving and reading this story which brings together the real and the magical. A real him in a magical story! The tiny adventure in this good-looking book is very personal and at the same time very important too. Because what’s in a name? A lot, especially if it belongs to a child. This comment was posted by Prasad Babu, which got deleted by mistake. it looks like oh my name has stolen concept from LOST MY NAME(https://www.lostmy.name/en-GB).its really sad when someone steals the concept or does plagiarism. bloggers though they don't have much intellectual property on blogs,they are protected by some plagiarism checker software.same is applied to others creativity too,oh my name has stolen creativity of others.really really sad. though its inspired by movies like jumanji,zathura and the polar express.after bollywood, indians started plagiarism in children books too." "The concept / idea of personalization based on the letters of child's name has been there for more than 15 years. 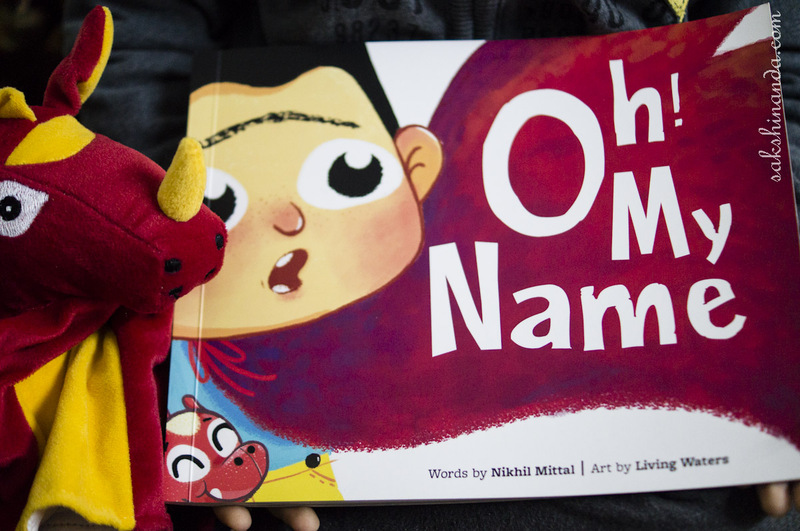 "My Very Own Name" by ISeeMe (www.iseeme.com) probably came up with the original idea of the child not knowing his / her name and eventually getting it from various animals, letter by letter. There are now a number of companies doing a similar thing (with some modifications): www.mymagicname.com, www.mygivenname.com, www.lostmy.name, www.wondrousink.com, www.marblespark.com etc. So as far as stealing of idea / concept / creativity is concerned, I believe ISeeMe should be the one really "feeling sad" about it. Now talking about copyright / IP etc, I am no lawyer but my understanding is as follows : Ideas / concepts CANNOT be copyrighted (except in a VERY VERY rare scenario). What can be copyrighted is the EXPRESSION of those ideas / concept. 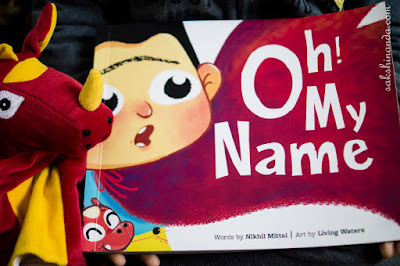 Now before you talk of plagiarism, I request you to again go on www.ohmyname.net and give a thorough look at the content we have developed and the way we have expressed the idea (be it the text, illustrations or the hand puppet). You will probably realize it yourself how different it is and the amount of time / effort (not in months but years) the team here has put in to design the book / cover (not to forget the spine) / stories (each and every word and the characters) / climax / all the subtle messages / hand puppet (a virtual friend who actually becomes real) etc. So, as I said yesterday over the chat on Oh! My Name website, feel free to call me if you still have any doubt. I will be happy to put all your concerns to rest. Our free plagiarism checker for teachers is one of the best proofreading help available today as this offers advanced correctional methods towards grammar, spelling, punctuation and word usage. The success of sites providing online spelling check enables students to ensure the superiority of their papers at minimal cost. I love the concept of connecting the dots. It seems like a sure shot to pure and unadulterated fun. I really like your brand of pouring your emotions and expressions in your observation. It makes it a wonderful experience for a reader like me to enjoy your interpretation, Sakshi. Thank you so much for your wonderful advice, I’ve just set up a blog and I LOVE your advice, it’s helped me so much. This is the first time I’ve ever commented on a blog, I’ve added commenting onto my daily to-do list now thanks to the great post. Early year education is critical stage of learning because it helps your kid to urge prepared for his/her future learning’s and success. At this read here little age parent ought to have a watch on their kids in order that he chooses the correct path.